Great image, love the pose and expressions as well as the rendered realism. I got the products. They all look great. Thanks! Just a bit of a question: They seem to load okay in DS, but I'm not seeing the Poser files going into Poser's Runtime folder--they're loading into DS, too. What am I supposed to do to instruct the files to go to Poser?? I've got Poser 7 & DS 4.5. Do I have to have Poser 9 for them to load properly? 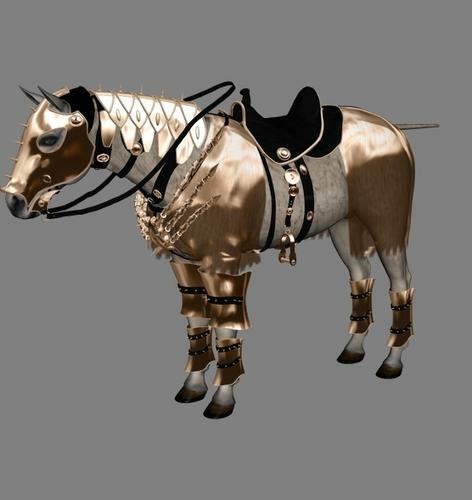 The horse2 is weightmapped and weightmapping is supported in P9 and PP2012, but not before. Why do none of the DAZ Horse 2 skins have bump/normal (or even displacement) maps? (I bought the pro bundle, so have all the skins). They all look VERY flat when rendered, especially up close. 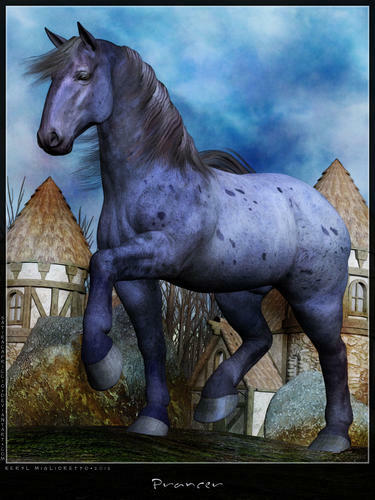 My current render, I ran the skin through ShaderMap 2 to generate normal maps for the horse, but that still doesn't compare to properly made maps by someone that knows what they're doing (e.g., not me -- I just mess about with the sliders in ShaderMap 2 until I have something passable). Yea, noticed that too cwichura. You might add in a noise map in the bump or displacement channel and see if that helps. I tried just about everything and was a bit disappointed in the flat appearance in the maps. The horse2 is weightmapped and weightmapping is supported in P9 and PP2012, but not before.Oy. I was afraid of that. I can upgrade, but it'll take me a few months to gather the $$. I guess in the meantime, I should try to learn DS. Has anyone tried the bend on the elbow actor? Yeek! I guess it's there to make it more compatible with the MH1 poses but don't use it! I like the shape of the hindquarters better, but the bends I'm not so impressed with. I like that the mane and tail are conformers rather than part of the mesh. I bought this to see if I could adapt my animations to it, and it is doable, but frankly I like the shoulder motion on the older horse better. This new version has a weird mesh bulge on shoulder bends. Do these horses actually walk forward, or do they walk on the spot? Is this addressed to me? If so, they can do both. I have a question about how you made the clone shape. I decoded it and installed it, and I'm able to fit items to Horse 2 and select Millennium Horse as the original figure, and some modifications are made so that some pieces fit better... but were you trying to match the whole body shape of the original MilHorse in the clone? Because this is what I get for fits. 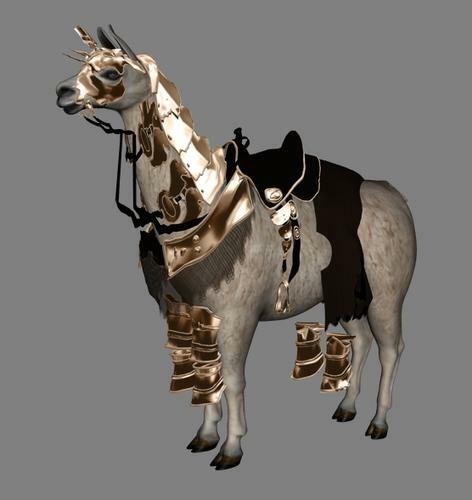 One image is Astral Armor items loaded into scene with no fitting, one is fitted to Horse 2 using the clone, and the last is items fitted to Horse 2 with the Llama morph. Granted, that's an extreme morph and I'm not surprised to get some distortion, but even the fit to the plain horsie is... well... you can see. Well ... sorta. Too bad the horse was rushed out without a decent tail and mane. Good news for those who love the old Charger Fantasy Tack! 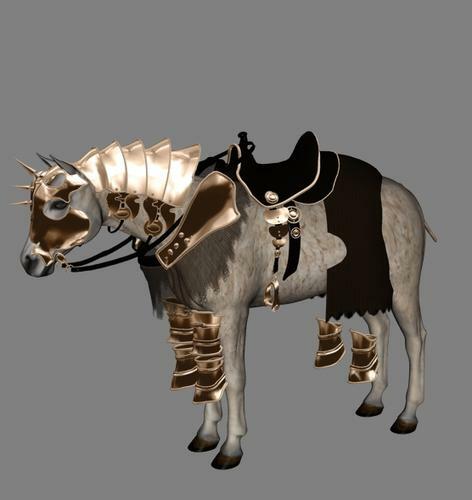 With CauriB's Milhorse clone and Bloodsong's fit to the MilHorse (rte encoder required) we can have the old Fantasy Tack (Saddle only) on the new DAZ Horse 2. I'd forgotten about it and found the Bloodsong conversion in my MilHorse directory while poking around. 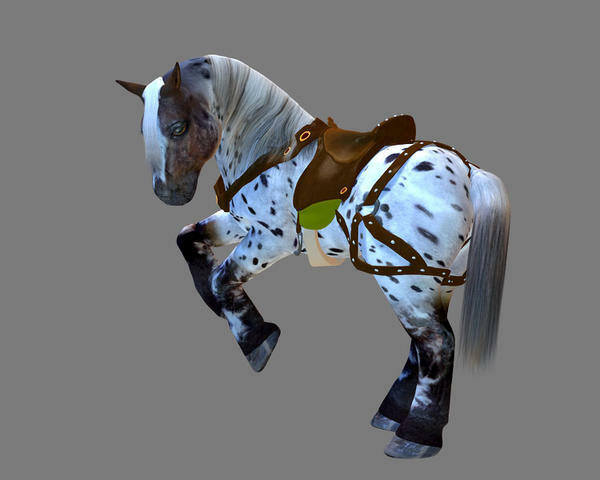 I had loaded up DAZ Horse 2, then I clicked on the converted Fantasy Saddle--I had to hunt down the textures because I had them in a different place than the .cr2 expected so be careful of that and know where your textures are. The transfer utility popped up, select milhorse from the clone dropdown. That's it. Astral Armour/Spinebender were a double set - one (AA) for the Charger, one (SB) for the Mil Horse. Thank you for the heads up - and that is an adorable pony! Yes, I figured that out. :) if no one else has made a Charger clone by this weekend, I'll probably tackle it. 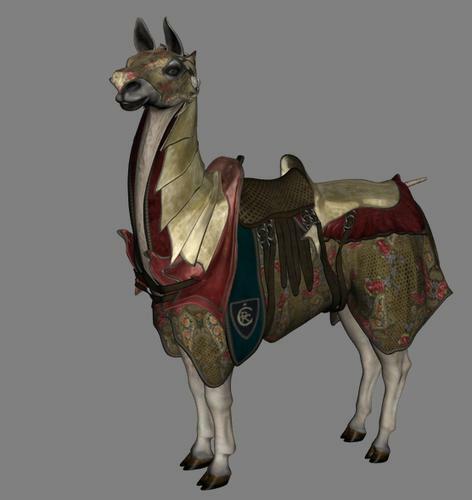 And maybe the camel, though there isn't as much gear for it that can be converted. 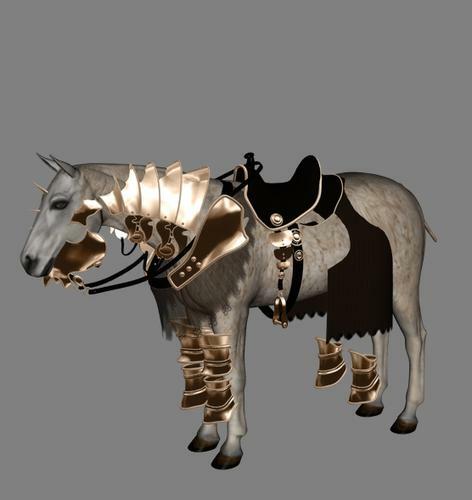 And I'll take a look at the Poser horse, not for UV mapping, but just to see if I can get a clone shape to work. What else.... Maybe the reindeer? I don't know as I'm up to making a morph good enough to use in an image, but I've had pretty good luck making clones. So, how do you make a Clone? 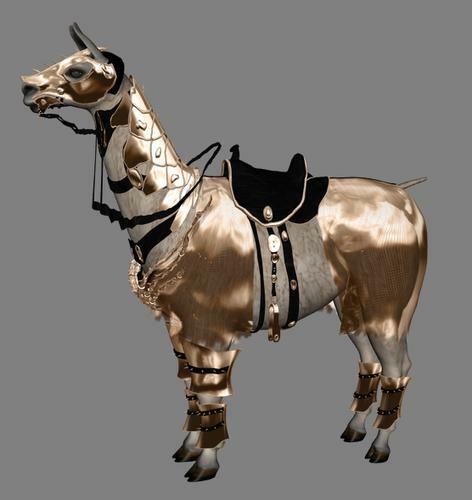 Do you perchance have the adHorse? It's a nice one that grazes beautifully. Almost no poses for it though. BUT it has CONFORMING mane, short mane, and tail all with morphs! It would be neat if we could use them with DH2. I don't have that one yet, but that's a good idea too. :) Let me get the Charger done first, and Poser Horse, and we'll see what comes next. As for how you make a clone... I usually start by loading both figures into the scene. Then I start adjusting scale of Genesis (or Horse 2) body parts until everything gets pretty close to the scale of the model I'm trying to clone. In particular, joint boundaries should match up. If the mesh needs to be stretched or shrunk a bit other than what whole bone scaling can do, I use D-Formers (magnets). Then I save out the result as a morph, and put it into the Clones folder (see the other things in there for examples). Love a really good tutorial for this procedure. I want to see if it's possible to get Apollo's clothing over to Genesis as there are some parts that are really nice. It should be quite possible. I had completed clones for V3 and M3 just before I found out DAZ was working on their own. It didn't take me all that long. It all depends on how close you want the fit to be. For my V3/M3, I wanted the Morphing Fantasy Masks to work, so I paid attention to facial details, but usually you don't even need to get those too close, considering you're going to want to use smoothing and collision to make up for various distortions in the conversion process.